Generally I don’t particularly care about these sorts of things, but having seen “Iron Man 3” perhaps more times than should be legal, I noticed this little error. Truth be told, it’s less of an error than the filmmakers apparently showing us what they can get away with when viewers are in awe over one of their favorite comic characters appearing on the big screen (for the fourth time). What happens is that James “Rhodey” Rhodes/War Machine/Iron Patriot (Don Cheadle) is captured by Aldrich Killian/Fake Mandarin (Guy Pearce), who uses his Extremis-derived abilities to superheat a section of the armor, with the intention of forcing Rhodey to abandon it. Killian knows that he’s damaging the surface of the armor, and so he strongly suggests that his henchman, Savin (James Badge Dale) had better be able to fix it. Now, Savin may indeed be talented, but prior to this moment the movie gave no indication he also had some pretty awesome metallurgical, as well as painting, skills because the next time we see the Iron Patriot armor, there’s no sign that there was any damage at all. I mean not even a smudge of the paint. I also know that we’re watching a movie based on a comic book, but Savin making what looked like considerable damage disappear is probably the most outlandish thing in the movie. Though you have to admit that the man is talented, and if Tony needed any help in his lab, he could do worse than hire him. 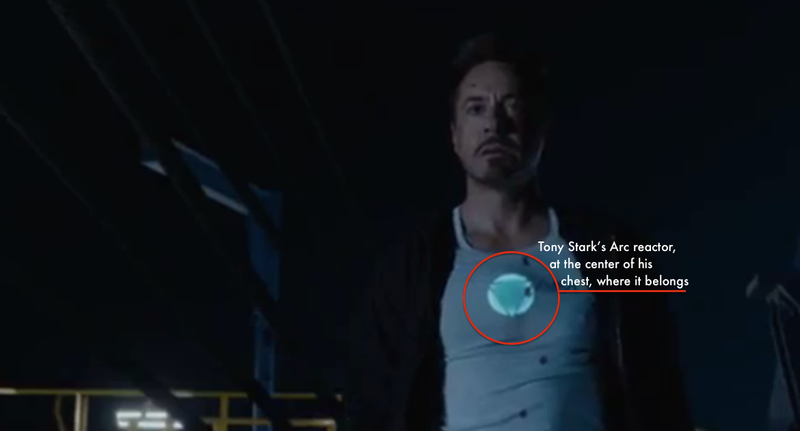 By the way, anyone that has been following the Iron Man films–Yes, even “Iron Man 2!”–knows that Tony Stark/Iron Man (Robert Downey, Jr.) has an miniature Arc reactor in his chest, which keeps a piece of shrapnel from entering his heart, which is pretty much at the center of the chest (which is why the armored suits he wears don’t have the chest repulser off to the left or right). Only to find that in later scenes it has somehow shifted considerably–and quite noticeably–to the right. It’s not like it’s now on his shoulder or something, but it’s definitely no longer in the center of his chest. Occam’s Razor posits that when faced with explaining why or how an event happened, the simplest explanation with the fewest assumptions is more likely than not the correct one. 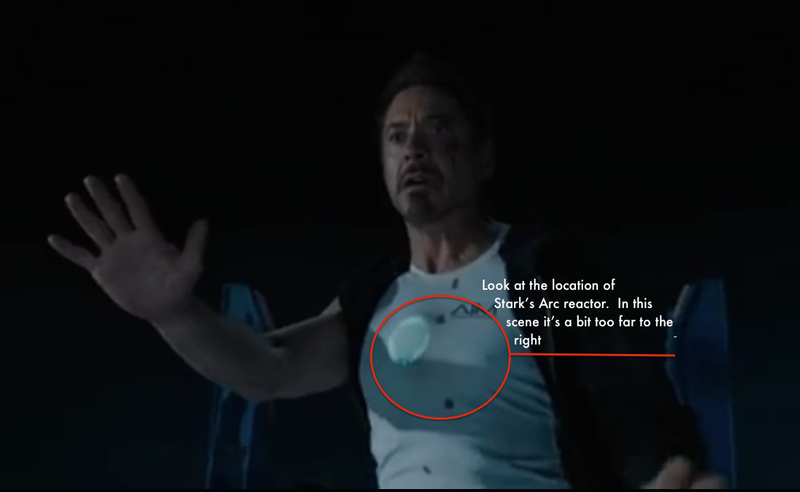 So, considering that that Arc reactor prop was entirely practical, it was probably somehow adhered to Robert Downey, Jr.’s chest, and with all the activity that the film required from him, shifted a bit. And you know what, I’m OK with that because what the filmmakers could have went with was a CGI Arc reactor, as opposed to a practical one, though the problems it would bring would probably quickly disabuse them of the notion. 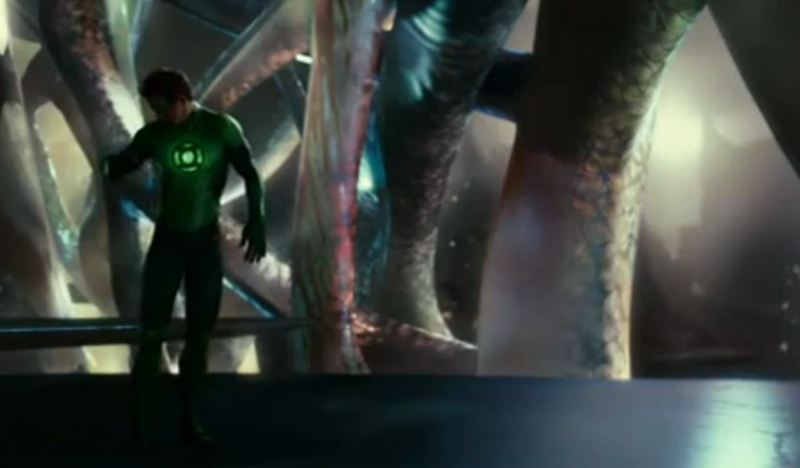 For instance, if it were computer-generated, it would have to look slightly different every time it appeared on screen because of changes in lighting conditions as well as his body shifting. It’s certainly doable, by why would anyone want the added cost, when you could create an Arc reactor medallion, have him wear it, and save yourself (probably) thousands of dollars. And besides, we’ve seen a movie that was so chock-full of computer generated effects that even the costume that the actor wore wasn’t real. A Movie About Me! What Could Go Wrong? Posted in actors, Disney, Marvel Studios, Movies, My Two Cents.Tagged Arc reactor, Don Cheadle, Don Heck, Extremis, Guy Pearce, Iron Man, Jack Kirby, James Badge Dale, Jr., Larry Lieber, Robert Downey, Stan Lee, Tony Stark.